The Latest Elseworlds Preview Shows Us What "a Real God Can Do"
Next month, the Arrowverse’s greatest heroes will reunite for the annual crossover event. But Elseworlds is promising to shake things up on The CW. Somehow, Oliver Queen is living Barry Allen’s life as the Flash, while Barry is taking on the Green Arrow‘s mission. Aside from Barry and Oliver, only Supergirl realizes that something has gone wrong. Now, we have a better idea of how this year’s villain is pulling it off. The CW has released a new promo for Elseworlds that features Jeremy Davies as John Deegan, a doctor at Arkham Asylum. How could a mere mortal like Deegan gain the power to rewrite reality? The footage reveals that the Monitor has empowered Deegan to make the universe his plaything. And even when confronted by the heroes, Deegan doesn’t seem to be that bothered. After all, with the Man of Steel under his control, not even the trio of heroes can stand against him. This footage appears to confirm that Superman‘s black costume means he’ll be one of the villains in the crossover event. Most likely because Deegan tampered with his history. There’s also a glimpse of the instantly iconic team up between the trio and the Flash from the ’90s TV series as they face off against Superman. Elizabeth Tulloch and Ruby Rose are also making their Arrowverse debuts as Lois Lane and Batwoman, respectively. The crossover will kick off with The Flash on Sunday, December 9. Arrow will pick the story on Monday, December 10. And it will all come to a head on Supergirl on Tuesday, December 11. 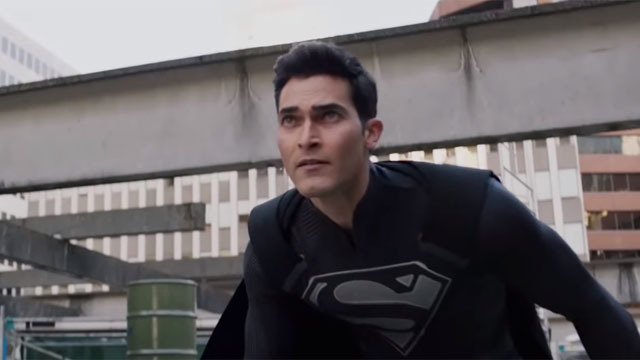 What do you think about the latest Elseworlds trailer? Let us know in the comment section below!